Valves are elliptic, with rounded poles. The axial area is straight, narrow and contains a filiform, straight raphe. A small, distinct, lyre-shaped hyaline area is present on either side of the axial area. The striae are radiate to nearly parallel and composed of distinct areolae. Striae are longitudinally interrupted by a hyaline rib which splits the striae into two or three areolae of different sizes. The areolae closer to the mantle are larger, one per stria, uniform and equally spaced through the valve; occasionally the central areolae are slightly distant forming unilateral gap. 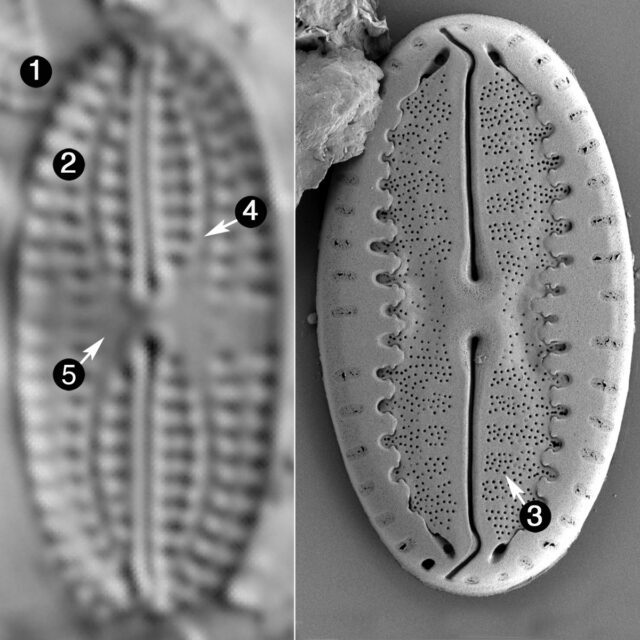 The inner areolae are smaller, one or two per stria, variable in size and position on both sides of the central area (i.e. weakly developed, widely spaced or absent). The central area is asymmetric, small or transapically expanded to unilateral fascia in some specimens. Areolae adjacent to the raphe branches are well developed on both sides of the raphe, forming equally long lines. 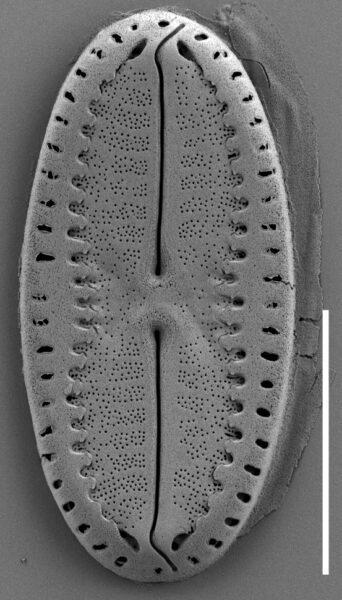 This taxon has been confused with Fallacia tenera, including on this website. These images from California appeared with the name Fallacia tenera on this website from March 2011 to June 2018, when the F. tenera page was revised and the F. californica page was made public. A pdf of the previous version is available upon request. This taxon was locally abundant in several coastal streams in southern and central California (Stancheva and Manoylov 2018). Sites where this taxon occurred had a wide range of environmental parameters. For example, specific conductivity of 39-3434 μS cm-1, pH of 7.1-8.6, total nitrogen of 0.1 to 2.2 mg L-1 and total phosphorus of 0.06-0.16 mg L-1. Valves are elliptical with rounded poles, 4–5.6 μm wide, 6–14.5 μm long (Figs 2–20). In girdle view (Fig. 9) ends look rounded too. The raphe is filiform and slightly arched toward the primary side of the valve. Terminal raphe fissures curved toward the secondary side of the valve. The striae are parallel in the center, radiate near the poles, 21/10 μm, composed of coarse areolae resolvable with LM. The lyre-shaped sternum distinctly panduriform, constricted in the center (Figs 3, 4, 10, 16, 17, 19), often clearly visible in the smallest valves (Fig. 15). Striae longitudinally interrupted by a hyaline rib which split the striae into two or three areolae of different sizes. The hyaline rib is often enlarged to fan-shaped near the valve center (Figs 2, 7, 8, 10, 15, 18). 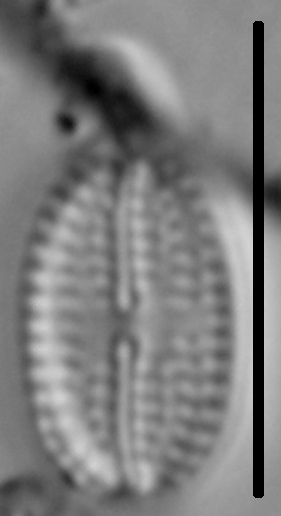 The areolae closer to the mantle are larger, transapically elongated, one per stria, uniform and equally spaced through the valve; occasionally the central two areolae are slightly distant and form unilateral gap (Figs 2–6, 8, 10, 12, 15–19). The inner areolae are smaller, one or two per stria, forming a longitudinal line which is curved inwards near the center (Figs 7, 10, 16, 18). The inner areolae are asymmetrical on both sides of the central area, smaller, variable in size and position, weakly developed, widely spaced or absent, or sometimes longer than the other areolae (Figs 10, 20). The central area is asymmetrical, small or transapically expanded to unilateral fascia in some specimens. Areolae adjacent to the raphe branches are well developed, single or double, forming equally long lines on both sides of the raphe (Figs 7, 10, 15, 16, 19). 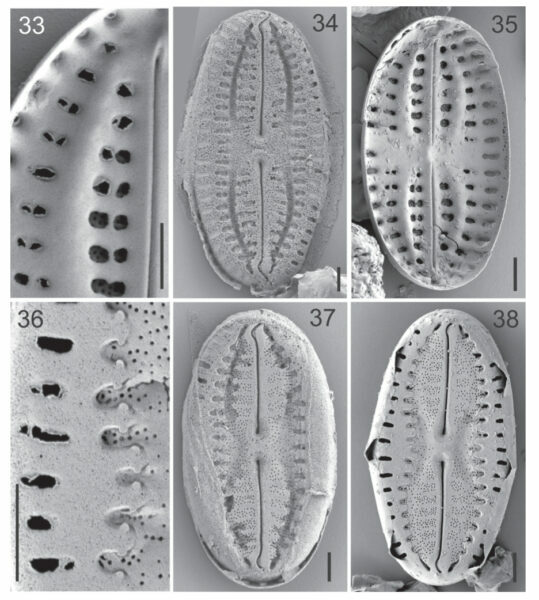 Internally, small helictoglossae are visible at the polar terminals of the raphe, slightly curved to the primary side of the valve (Figs 21, 24). On both sides of the raphe, depressed lyre-shaped lateral sternum is interrupting the striae (Figs 21–25, 35). The striae outside the sternum are crossed by longitudinal hyaline rib, which does not appear to be depressed (Figs 22–26). 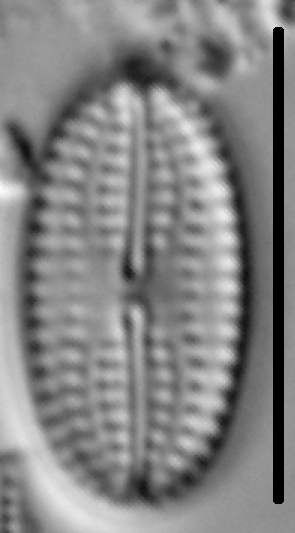 A longitudinal row with transapically elongated large areolae is positioned on the valve mantle (Figs 21–25). These areolae are equidistant, except for the two central areolae on the primary side, which are separated by larger gap (Figs 24, 30–32). The inner areolae are positioned on the valve face. 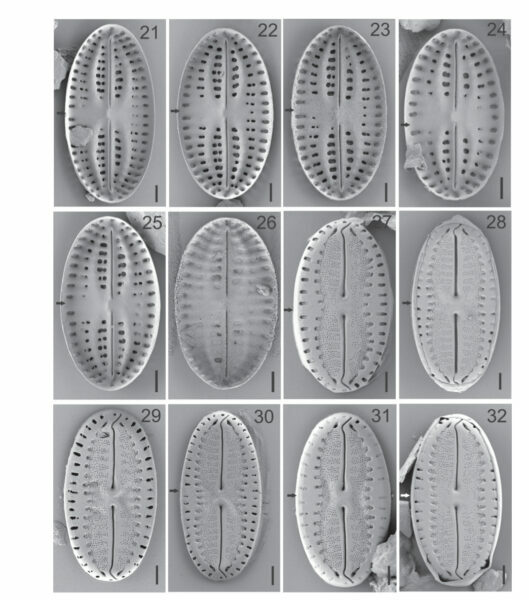 They are smaller and vary from elongated in a single row to circular in a single or double row near the center of the valve (Figs 21–25). One to four central striae on the primary side are absent (Figs 24, 25). The striae between the raphe and lyre-shaped sternums are transapically elongated, constricted, in a single row, or circular in pairs (Figs 22, 23, 35). The rows with areolae on both sides of the raphe branches are relatively symmetrical. 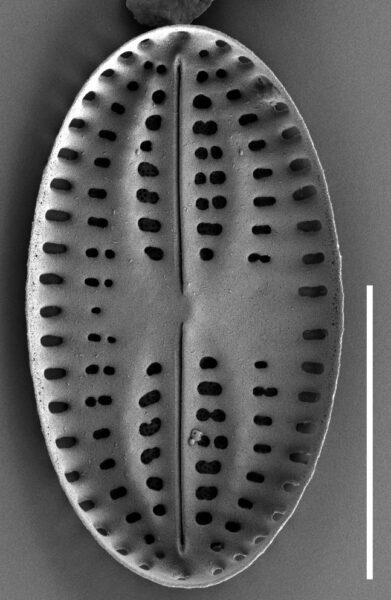 Internally, the areolae are occluded by thin hymenes, which are often dissolved, but partially visible on Figs 24, 25, 33. Externally, the areolae on the valve face are covered by a finely porous conopeum from the raphe sternum to the valve mantle (Figs 27–32). The edge of mantle possesses finger-like protrusions, each with two to four “pegs”, which fasten the connection of the conopeum and the mantle (Figs 30, 31, 36). The central 4–6 finger-like mantle protrusions are longer and more pronounced than the other (Figs 29, 31). 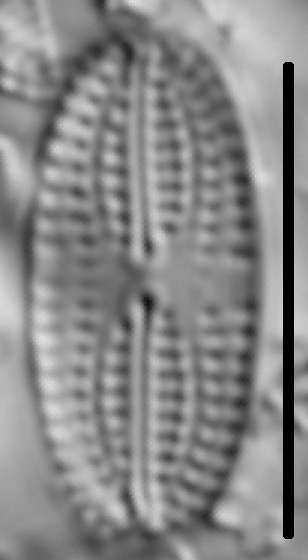 The images with broken conopeum (Figs 34, 37) show that the lyre-shaped lateral depressed sterna and the finely porous conopeum comprised two longitudinal canals that connect with the exterior by pores on both sides of terminal raphe fissure. The cingulum is composed of at least one wide open girdle band (Figs 28, 32, 37, 38). Type: USA. California: Aliso Creek, Orange County, 33.54743949, -117.72230590, Jim Mann, May 17, 2016 (holotype GCP4211 circled specimen on the slide; isotype RS! 015, circled specimen on slide and material, CSUSM, USA). Valves elliptic, with rounded poles. 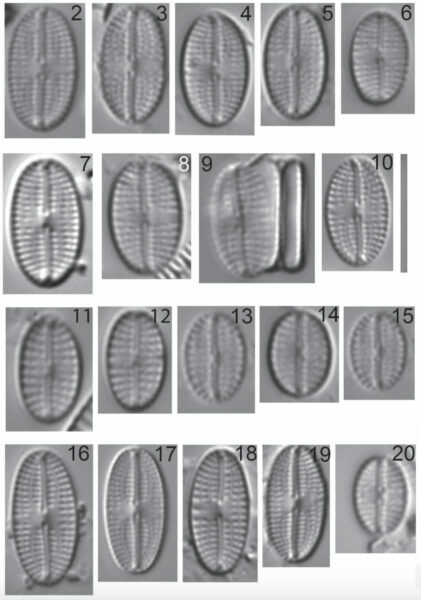 Striae are composed of distinct areolae. 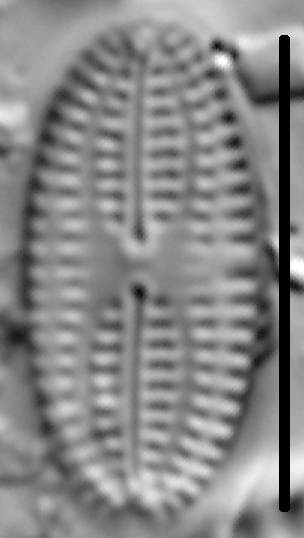 A small, distinct lyre-shaped hyaline area is present on either side of the axial area. An asymmetric central area is bordered by variable central striae.